British automakers have different names for many parts of automobiles. In England, what we call valves are called tappets, so the stamped metal piece that keeps oil in and dirt out is the tappet cover. The tappet cover seems like a simple enough component, but when you're restoring a British car (and buying new parts) you'll find that the tappet cover requires more than a single expenditure. In fact, all the little items associated with the tappet cover can add up to a fairly substantial total at the bottom of an invoice. 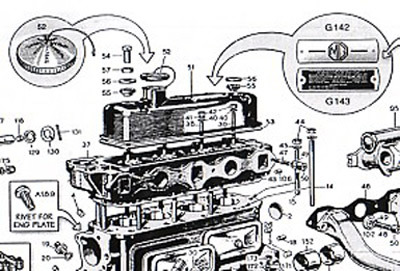 This illustration shows the valve cover, oil cover, hold-down parts and the MG logo and Weslake patent plate. Not shown are the "clothes-pin" style rivets for the plates. Take the tappet cover illustrated here. It is designed for the British Motor Corporation (BMC) overhead-valve, four-cylinder, "B" Series engine. This engine was used in many models. Cars such as the MGA and MGB used dual-carb versions, while the Nash-Metropolitan used a single-carb version. Here is an MG Magnette ZB tappet cover. The round "pocket watch" is the oil filler cap. Note the eye-type electrical connector someone added to the tether wire. The small rubber grommets keep oil in the tappet cover. The particular tappet cover pictured here is from a 1957 MG Magnette ZB saloon. Counting hold down nuts, hose clamps, a cork gasket, two data plates and two rivets that fasten each of them and the oil filler cap, there are at least 22 parts that have to be refinished or replaced to restore this tappet cover. Make that 23 if you want to replace the cork seal on the underside of the oil filler cap. That round thing that looks like a pocket watch is the oil filler cap. This white-faced style is not correct for a Magnette which uses an aluminum-finished cap. There are also caps with natural copper finish. Note the eye-type electrical connector that the car's D.P.O. (dreaded previous owner) added to the tether wire. And some cars use a chain to tether the cap, instead of a wire. The small round pieces, that are incorrectly painted red, are rubber grommets that seal the top of the tappet cover and keep the oil inside it. They should be natural black rubber. As you can see, the one on the right is in tough shape. A steel cup washer fits over the rubber grommet when the valve cover is installed. A distance piece (spacer) sits on top of the cup washer. Everything is held in place by a cap nut that screws on two longer cylinder head bolts that will protrude through openings in the tappet cover when the engine is assembled. Two sets of these fastening parts are required to hold the tappet cover in place. 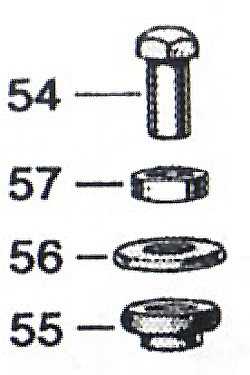 Cap nut (54), distance piece (57), cup washer (56) and rubber grommet (55). There are two data plates (to use American terminology) on top of the tappet cover. One is the MG logo plate and the other is called a Weslake patent plate. Both plates are held on by "clothes pin" style rivets. If these rivets weren't very tight fitting devices, the hot engine oil would seep through the rivet holes. The hobbyist restoring this car had originally planned only to strip the dirt and old paint off the tappet cover, repaint it and then clean up the old hardware and plates. He found out that reproductions of the plates and small parts were available from catalog suppliers such as Scarborough Faire, Moss Motors, Abingdon Spares and Victoria British at remarkably reasonable cost. For instance, the cap nuts were $2.90 each, the grommets were 50 cents, the cub washers were 70 cents, the distance piece was $1.50, the MG plate was $3.65 and the patent plate was $4.60. These suppliers also sell the special clothes-pin-shaped rivets (40 cents each) used to hold the logo and patent plates on. The cork tappet cover gasket came in the engine rebuild kit. When the tappet cover was first placed on the gasket, it twisted at one spot. Close inspection showed the old tappet cover had a very small kink in the lip at that same spot, so the restorer carefully flattened the kink. After that, the tappet cover sat on the gasket just right with absolutely no twists. 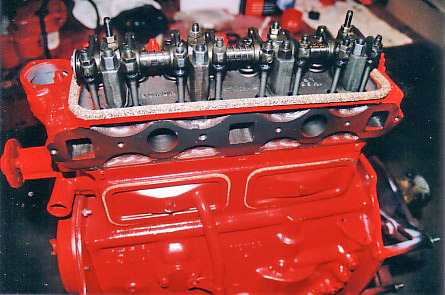 Here you can see the two longer head bolts (one on each end) that protrude up through the openings in the valve cover. When he installed the new MG logo and Weslake patent plates on the tappet cover, he put a thin bead of red silicone sealer around the bottom edge of each plate about 1/16 inch in from the lip. This insured a good oil seal. He then installed the clothes pin type rivets. These were developed because restorers do not have the tools that factory workers used to install the original rivets. The clothes pin rivets look just like the factory rivets on the outside, but the bottom end that goes inside the tappet cover resembles a clothes pin with two legs or "tangs." These tangs have to be bent back during installation — kind of like the claps on a manilla envelope — so that the plates fit tight and seal oil in. Carefully place the refinished tappet cover on the MG Magnette block. 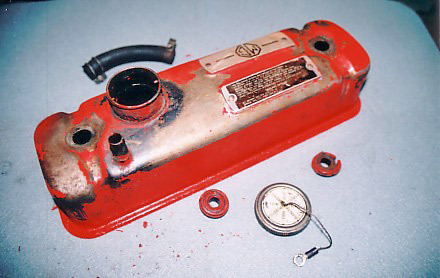 The Magnette oil cover should be plain. The white-faced one that came with the car was probably from an Austin. The tether wire goes in a slot on the filler neck. To hold the rivets in place, first spread the tangs at the bottom end of the clothes pin very slightly with the tip of a small flat-blade screwdriver. 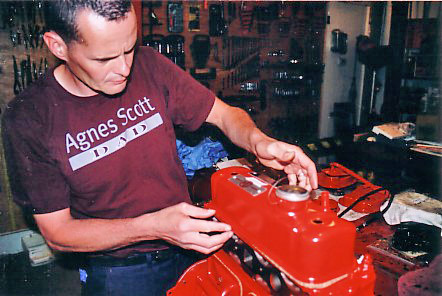 Then, place the valve cover upside down on a terry cloth shop towel and spread the tangs a little further with a chisel and small hammer, being sure not to tap so hard that the chisel cuts the tangs. You must also avoid tapping so hard that you dent or distort the flat surfaces that the plates seal against. Use an impact punch, such as those included in bearing driver sets, to flatten the tangs of the rivets back so the plates are held tightly in place. With the tight fit of the rivets and the silicone sealer on the bottom surface of the plates there shouldn't be any oil leaks.